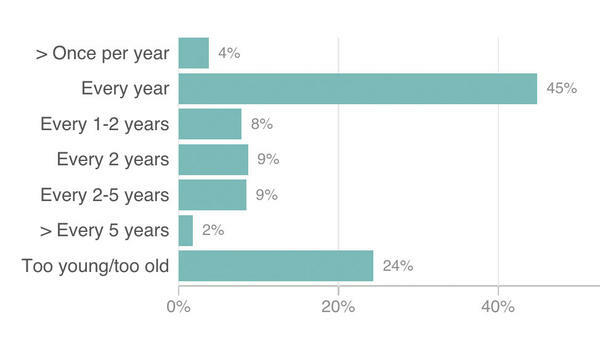 Most women 40 and older believe they should have mammograms every year to screen for breast cancer, the latest NPR-Truven Health Analytics health poll finds. The finding is at odds with current recommendations by the U.S. Preventive Services Task Force that women with typical risks for breast cancer have screening mammograms every two years starting at age 50 and until they turn 75. The decision about mammograms for women in their 40s is a personal one. The task force found a small net benefit for biennial screening of women ages 40 to 49. The guidelines say women should take into account their health situation as well as their views on the benefits of early cancer detection and potential harms, such as unnecessary biopsies and surgery. The USPSTF said there wasn't enough evidence about the benefits from mammograms for women age 75 and up to make a recommendation. The task force is working on an update to the mammography guidelines, which have sparked controversy since they were last revised in 2009. The thrust of the draft advice is pretty much the same as it has been, but there's more nuanced discussion of the benefits and potential harms for women in their 40s. The NPR-Truven Health poll found almost two-thirds of women ages 50 to 74 believe that they should have a mammogram annually. For women 40 to 49, the number drops to 56 percent. For women under 40, about 45 percent believe they should have a mammogram every year. Overall, 57 percent of women believe an annual mammogram is appropriate. "The Task Force is happy to see that women are making informed decisions with their doctor about breast cancer screening and continue to have access to mammography screening," Dr. Kirsten Bibbins-Domingo, vice chair of the USPSTF, told Shots in a statement emailed after she reviewed the poll's findings. "Mammograms are an important tool in helping women avoid deaths from breast cancer. The value of mammography screening increases with age, with women ages 50 to 74 benefitting most from screening. In this age group, the evidence indicates that women get the best balance of benefits to harms when screening is done every 2 years." She added, "The decision to start regular mammography screening for women in their forties should be an individual one that women make in consultation with their doctors and after consideration of their health history, preferences, and how they value the potential benefits and harms of screening." The task force's advice is influential, but its guidelines aren't the only ones around. The American Cancer Society, for instance, recommends that women 40 and older "have a mammogram every year and should continue to do so for as long as they are in good health." After reviewing the poll's findings, Dr. Michael Taylor, Truven's chief medical officer, told Shots: "There needs to be more education about the problem of false positives. If you do mammography every year starting at 40, you're going to find a lot of things that don't matter." There may be benefits for some women, but many will also be subjected to unnecessary biopsies and surgeries, he said. "We don't think enough about the harms of interventions" triggered by mammography, he said. As for the belief that annual mammograms are best, Dr. A. Mark Fendrick, a professor of internal medicine at the University of Michigan Medical School, says, "It's much much harder to take away something that you're already doing than it is to start a behavior from time zero." "More isn't always better," Fendrick says about screening tests, including mammograms. But there are some people with family histories of disease or who have specific genetic risk factors who should be screened more often, he says. Overall, 48 percent of respondents were aware that the Affordable Care Act requires insurers to cover mammograms without any out-of-pocket costs. The NPR-Truven Health Analytics Health Poll on mammograms was conducted in June. More than 3,000 women across the country were interviewed. The margin for error is plus or minus 1.8 percentage points. You can find the questions and full results of the latest poll here. For previous polls, click here.